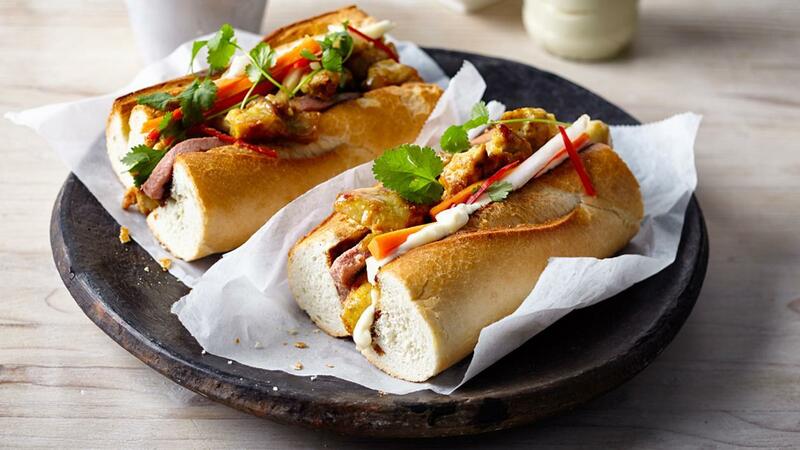 Bánh Mì is the fusion sandwich of French and Vietnamese cuisine, typically filled with pork meat, French pâté (liver paste), pickled vegetables, mayonnaise and soy sauce. But it could just as easily be spicy shrimp or grilled tofu. This recipe is inspired by London based shop Whaam Bánh Mì and their “Chicken lemon grass” version. Slice the chicken in stir-fry slices. Finely chop the garlic and slice the lemon grass stalks thinly. Mix with the curry powder, the fish sauce, 2 tablespoons of oil and the chili flakes, making a marinade. Pour over the chicken and leave to marinate for 30 minutes. Heat up a wok. Add 2 tablespoons of oil and wait until it starts smoking. Add your chicken thighs and move around to prevent them from sticking to the wok. Once browned on all sides, toss a couple of times and take off the heat. Combine vinegar, sugar and salt in a saucepan over medium heat. Once sugar and salt have dissolved, remove from the heat, add carrots and daikon and stir to coat in pickling mixture. Let stand until carrots have slightly softened. Drain and set aside. Spread 1 tablespoon of mayonnaise on each baguette side. Fill with pâté (if using), chicken thigh, pickle, cilantro leaves and sliced chilis. Sprinkle each sandwich with soy sauce.